The Mexican Mariachi ensemble and Azeneth’s powerful voice fill us with life and faith through a combination of traditional and new Catholic songs. A Mariachi is an ensemble with styles that capture the spirit of Mexico. Being one of the most traditional ensembles with trumpets, violins, a guitar, vihuela and guitarrón, it meets the swelling and belting voice of a singer like Azeneth. This collection beautifully captures the essence of Mariachi music and allows Azeneth’s diverse vocal ability to stand out and inspire people’s hearts. With four original songs written by Azeneth herself, this collection includes “Va Más Allá,” whose lyrics evoke the peace and strength that we find under God’s love, as well as “Uno en Dios,” a duet with her husband, Miguel, about the blessing of marriage with God as witness. “Tu Voluntad” is a ballad with inspiring lyrics about repentance and a prayer for strength, while “Viva Cristo Rey” uses original text that celebrates the resurrection of Christ with its energetic arrangement using a traditional patriotic melody. The other six familiar tunes have become iconic Catholic songs in the Spaish-speaking community such as, “Que Detalle, Señor,” a joyful piece — one of Pope Francis’ favorites — about devotion and answering God’s call to walk with him. “Cien Ovejas (Visión Pastoral)” is one of the most sung pieces among Hispanic Catholics, referencing the Parable of the lost Sheep. “Pescador de Hombres” doesn’t need an introduction, for it has crossed borders and generations. But in this collection, it is now offered with a Mariachi arrangement. “Mi Virgen Ranchera”, “Mi Virgencita Morena” and “Paloma Blanca (Buenos Días, Paloma Blanca)” share the joy of honoring Our Lady of Guadalupe. These three pieces capture the energy of the faithful, not only in Mexico where thousands of people travel from all corners of Mexico to gather on December 12 to honor Our Lady of Guadalupe on her feast day, but throughout Spanish-speaking countries throughout the world and beyond. 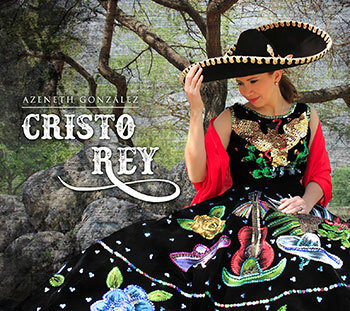 Through Cristo Rey, Azeneth González returns to her roots using Mariachi styles that are popular within the Hispanic community. She shares a love that is bigger than our hearts through a voice that will inspire all who listen.